The Rupes LHR 12E Duetto Random Orbital Polisher Deluxe Kit gives you serious paint correction in a highly-engineered, inclusive kit. The centerpiece of this impressive kit is the Rupes LHR 12E Duetto �Bigfoot� Random Orbital Polisher, a large-stroke dual-action orbital polisher masked in a traditional body. Also included is two grades of fine sandpaper, four polishing pads, colored-coded polishing compounds, an interface pad, microfiber towels, a detailing apron, and handy bag to store it all. In the not-so-distant past, correcting severe paint imperfections such as orange peel, deep scratches, and oxidation required a coarse sandpaper, a high-speed rotary polisher and a high level of skill. The Rupes LHR 12E Duetto Random Orbital Polisher Deluxe Kit gives users of all skill levels the ability to correct paint defects quickly while maintaining the safety features inherent to a random orbital polisher. Rupes engineered each part of this kit to work together to deliver consistent results, from the machine's design to the weight of the pads. The Rupes LHR 12E Duetto Random Orbital Polisher is a large-stroke dual-action polisher. The free-spinning, large-stroke design of the Duetto gives it the ability to polish paint much faster than other �DA� polishers, which reducing the risk of overheating the paint, slicing through an edge or creating swirl marks. Part of the the Bigfoot family of polishers, the Rupes LHR 12E Duetto Random Orbital Polisher is engineered to the finest detail so you get the best results. The dramatic increase in performance offered by Rupes Big Foot Polishers is the culmination of precise engineering, forward thinking and creativity. The Rupes LHR 12E Duetto Random Orbital Polisher benefits from all of the aforementioned attributes to give you a paint correction tool with the polishing power of a circular/rotary polisher, while retaining all of the benefits of a dual-action random orbital polisher. Whether you're a novice who is looking to achieve professional results in a safe manner or a professional who is looking to increase speed and efficiency, the Rupes LHR 12E Duetto Random Orbital Polisher is for you. Compared to most dual-action polishers which feature a 8mm (5/16 inch) stroke or throw, the Duetto gets its polishing power from an impressive 12mm throw. For each orbit the polishing pad makes, the Rupes LHR 12E Duetto Random Orbital Polisher moves the polisher 50% further, resulting in a dramatic reduction in the amount of time needed to correct paint. The Rupes LHR 12E Duetto Random Orbital Polisher large throw and impressive 400-watt motor ensure fast paint correction. Because it is a dual-action random orbital polisher, it will never create swirl marks so you can achieve a perfect finish in less steps. Unlike it's bigger Bigfoot brothers, the LHR 15ES and LHR 21ES polishers, the Duetto features a traditional random orbital body. 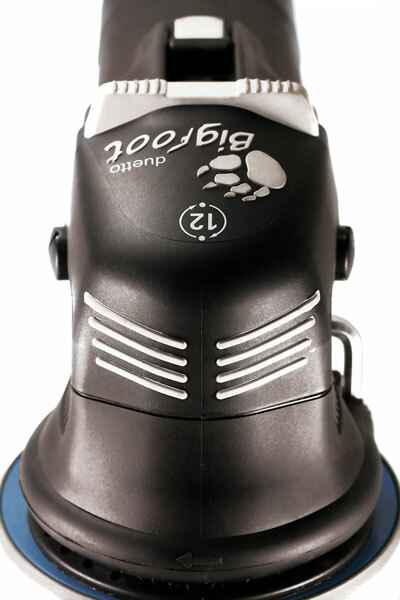 This ergonomically designed polisher features a thumb operated on/off switch and a speed dial for precise control. With its non-slip rubber inserts on the front cover, the Rupes LHR 12E Duetto Random Orbital Polisher is easy to control in difficult-to-reach areas. The Anti-Spinning Shroud prevents the pad from over-rotating when lifted from the paint, for improved safety and longer pad life. The Rupes LHR 12E Duetto Random Orbital Polisher's 12mm stroke is not only ideal for paint polishing, it makes this machine excellent at machine sanding paint finishes as well. With the Rupes LHR 12E Duetto Random Orbital Polisher Deluxe Kit's included sanding discs, you can level orange peel and eliminate deep scratches quickly, then switch to the included polishes and pads and restore gloss. Designed specifically for the Rupes Duetto Polisher, this backing plate is perfectly weighted to maintain ideal vibration dampening when used with Rupes' pads. The built-in Anti-Spinning Shroud improves safety, pad life and machine useability. Carry your Rupes' products in style! The Rupes Big Foot Soft Polisher Bag holds all of the components included in the Rupes Duetto Random Orbital Polisher Kit comfortably so you can take your paint correction tools on the road with you. Constructed of water resistant nylon and ruggedly built, this bag can withstand the power of Big Foot. Stand out from the crowd and let them know you mean business with the Rupes Big Foot Detailing Apron. The last thing you want to do when polishing paint is to scuff the fenders while leaning over a panel. This solidly constructed detailing apron is made of soft polyester which will not scratch or damage your paint work. Rupes Zephir Gloss Coarse Gel Compound is a heavy-cut polishing compound that is engineered to work with the long-stroke design of Rupes' Big Foot series of dual-action random orbital polishers. When used with the appropriate Rupes Blue Coarse Foam Pad, this polishing compound is capable of removing P1500 grade sanding scratches. Even severe paint imperfections don't stand a chance. Rupes Zephir Gloss Coarse Gel Compound will maximize the polishing ability of your Rupes Big Foot Random Orbital Polisher so you can minimize the time you spend using it. Rupes Keramik Gloss Fine Gel Polish is a paint polish that is engineered to work with the long-stroke design of Rupes' Big Foot series of dual-action random orbital polishers. When used with the Rupes Yellow Polishing Foam Pad, Keramik Gloss is capable of removing P3000 grade sanding scratches from fresh paint. It is also the ideal choice in maintenance or 1-step polishing sessions. Rupes Keramik Gloss Fine Gel Polish is a fine polish that creates amazing clarity on all paint systems, while still having the ability to remove minor imperfections. The Rupes Blue Coarse Foam Pad 150 mm (6 inch) is an open celled foam compounding pad that is designed for maximum polishing action. Use this pad with Rupes Zephir Gloss Coarse Gel Compound on a Rupes LHR 12E Duetto Random Orbital Polisher to eliminate severe paint defects such as acid rain marks, oxidation, deep scratches, and 1500 grit wet sanding marks. The Rupes Yellow Polishing Foam 150 mm (6 inch) is a tightly packed open cell foam pad designed to smooth away paint imperfections without creating visible scratches. Use this pad with Rupes Keramik Gloss Fine Gel Polish on a Rupes LHR 12E Duetto Random Orbital Polisher to level fine paint defects such as towel marks or to remove heavy buffer holograms. This dual-sided pad is for use when using the Duetto for machine sanding. It fits between the backing plate and sandpaper, providing a pliable surface that allows the sandpaper to conform to curved body panels while reducing the risk of sanding pigtails and deep tracer scratches. Use these 5-inch sanding discs to remove severe scratches or orange peel from cured or fresh paint. The Rupes 5 Inch 2000 Grit Sanding Disc features a long-lasting abrasive for uniform and consistent results. Use these 5-inch sanding discs for moderate defect removal to refine a surface sanded with the 2000 Grit Sanding Discs. The long-lasting abrasives create a satin sheen that is easy to polish out. These flat-weave microfiber cloths are soft and paint friendly, while maintaining the bite necessary to remove stubborn polish residues. These towels will not scratch or dull your freshly polished surfaces. 4 Rupes Microfiber Cloths A total retail value of $598.00. You save $98.01! Made in Italy. Additional discounts are not applicable.